How can I Complete My First Oil Painting Guide Step by Step? This art instruction book by Rachel Shirley outlining twenty oil painting demonstrations on landscape art might help. Now available in large edition. 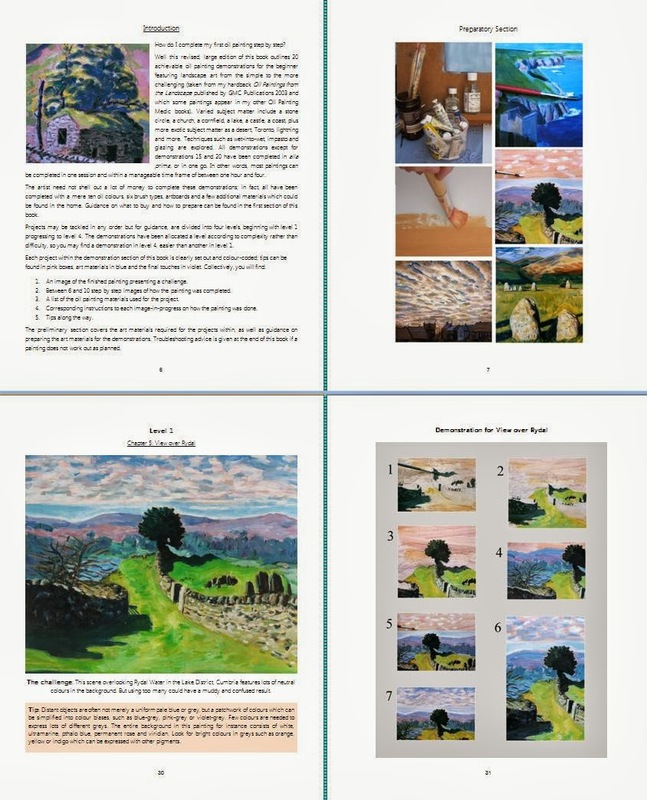 My book on landscape painting provides 20 highly instructive step by step demonstrations, supported by images-in-progress. A variety of landscape scenes provides choice and interest. Each demonstration possesses: image of the finished painting presenting a challenge; between six and ten step-by-step images of the painting in-progress; highly-directive instructions corresponding with each image, outlining the pigments used, the brushes and the technique; a list of art materials required for each project and tips along the way. A preliminary section outlines the art materials required for the demonstrations, which amount to just ten oil colours, six brush types, artboards and a few mediums, making the projects achievable whatever your ability or budget. A section on underglazing will prove invaluable for artists wishing to avoid wishy-washy colours or tonal imbalances in the painting, making satisfactory results more likely. Available on Kindle as well as print version, this ebook on oil painting also offers troubleshooting suggestions if the painting does not work out. Various oil painting techniques are explored, including: alla prima, wet-into-wet, scumbling, glazing, limited palette and working dark to light. As can be seen, many different effects can be achieved with just minimal oil painting materials as described within. See a preview of my book on Youtube. Subject matter to be found within this art book are: a river, a cornfield, a stone circle, a castle, a lake, a sunset, a coast, a desert scene, lightning, snow, Toronto, Kilimanjaro and others. This screenshot shows how the interior of this large edition looks. Each demonstration is allocated a level according to complexity with four levels in all. The artist however, might find a demonstration in level 4 easier than level 1, as each level describe complexity rather than difficulty, as more techniques and various mediums are explored in the higher levels. Book’s statistics: 19,000 words, 23 demonstrations (each averaging 8 images each) with around 187 colour images in total. A preliminary section outlines the art materials required and preparatory methods. The main body of the book covers the oil painting demonstrations themselves. The final section gives troubleshooting suggestions for problems, as well as a glossary. This book is also available on hardback. Large edition measures 10x8in with 86 pages, full of step by step images. Pocket sized edition is 8.5x5.5in and is 116 pages in length - compact enough to fit in a bag. Also available on Kindle. The Artist's Garden in Oil: 18 Step by Step Guides is similarly laid out.